The 2011 JVM Language Summit is an open technical collaboration among language designers, compiler writers, tool builders, runtime engineers, and VM architects. We are sharing our experiences as creators of programming languages for the JVM, and of the JVM itself. We also welcome non-JVM developers on similar technologies to attend or speak on their runtime, VM, or language of choice. The format this year will be similar to last year. We are dividing the schedule equally between traditional presentations (limiting most presentations to 30 minutes) and “Workshops”. Workshops are informal, facilitated discussion groups among smaller, self-selected participants. They enable “deeper dives” into the subject matter. There will also be impromptu “lightning talks”. About 70 language and VM implementers attended last year—and over one third presented. As was the case last year, we expect that the talks will be recorded. Three days of technical presentations and conversations about programming languages and the JVM. Prepared talks by numerous visiting language experts, OpenJDK engineers, and other Java luminaries. Many opportunities to visit and network with your peers. Dinner at a local restaurant, such as last year’s Faultline Brewing Company. 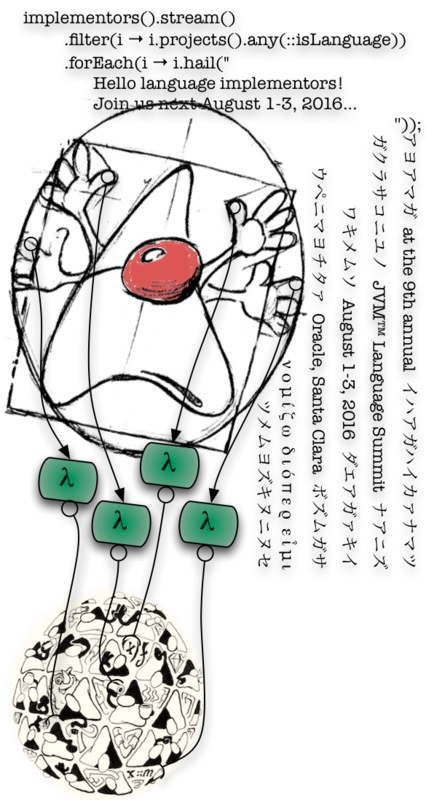 A chance to help shape the future of programming languages on the JVM. The logistics page has information useful to travelers. As space allows, we are open for registration at registration.jvmlangsummit.com (this will redirect to regonline.com). Space is limited: This summit is organized around a single classroom-style room, to support direct communication between participants. There will be a mix of presentations of various lengths. We have reserved a conference room which seats up to 60. If the available space fills up, presenters and implementors will be given priority. To cover costs, we are charging a nominal conference fee of $150 when your registration is confirmed. Questions? Please send inquiries to inquire@jvmlangsummit.com. Thanks for your support! We are looking forward to a great meet-up. Our short URL is jvmlangsummit.com. It redirects into the OpenJDK Da Vinci Machine Project.